New Year, New Resolutions & New Hope! I start this day and end this year with a new understanding and new resolutions. Life is an ongoing school of lessons. Somehow whether we like it or not we are forced to learn something. Either we learn and gain or not learn and suffer. There is no other option available to us! Period! Reading about the Samurai in vajrakrishna’s blog makes me ponder about my life. I too am a warrior. Not in the literal sense, but a warrior who is constantly struggling to keep my balance. This new year, my resolution would be to grow and learn from the swan. Hamsa, or the Swan, is the vehicle of Hindu Goddess Saraswathi. In Hinduism, Goddess Saraswati is the goddess of knowledge, learning and art. Interestingly, a Hindu saint who rises above the thoughts of death and birth and constantly meditates on Brahman is referred as Parama Hamsa. A famous shloka on Hamsa talks about the symbolism and significance of this majestic bird. 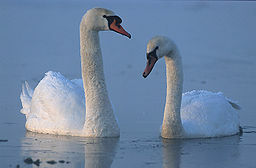 The swan can glide on water without getting its feathers wet. The swan may mean many things to many people but to me it represents the purity of the soul. It also represents its nature to separate the temporary from the permanent. I too hope that this new year will bring with it knowledge and understanding. Patience and purity. Love, harmony and compassion! Today ends 2009 and tomorrow is a new day. A new day with new hope and new resolutions. Thanks to facebook, I have been able to contact a few of my friends after 30 years ! Yes incredible isn’t it? I used to wonder all these years, whether I will be able to meet these people, since I did not know their whereabouts other than remembering their names. It was so exciting to know that they too remembered me. Exchanging some messages, I find that, I may be able to get in touch with some of the other girls too. I am excited to know that they are around somewhere, and I have another chance to catch up with the people that I thought, I had passed by in this journey of my life. I thought that I may never be able to meet them in this lifetime. Sounds huge but isn’t that the reality? We sometimes end up never meeting some people who made an impact on us. Memories of us being a little naughty runs through my thoughts. Can you imagine, going for a movie was taboo, back then. We would literally spin some stories to the wardens, to able to go out of the hostel on Saturday afternoons. A 20 to 25 minutes walk, depending on our pace, would take us to the bus stand close by. From there we used to go to the city to go to some theatre there for a movie. After the movie, we may go for an ice-cream before returning to the hostel. Coming back was a little difficult sometimes and we used to sneak in quietly without Padhu teacher’s knowledge. She was some disciplinarian. There was always the worry, that someone might catch us rushing back late from our outings. Sometimes we had to hush them and rush in time for dinner at the dining hall. Exhausted but feeling happy and at the same time a little relieved, to be able to come back without any problems, we will go to bed to prepare for the next day. Imagine that was the level of mischief we were allowed! There were times we were a litte bolder than that, but somehow it had to be within the limits. 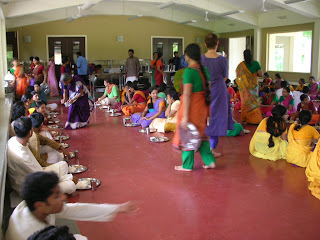 Sarees were the only attires allowed. Anything else was unacceptable. Some found difficulty in adhering to such strictness, but since it was a part of the culture there, we had to dress accordingly. I was not too experimental like some of the girls, who would wear pants beneath a saree and remove the saree on their way out during their jaunts ! The dining hall does look better now. There were no fans then. 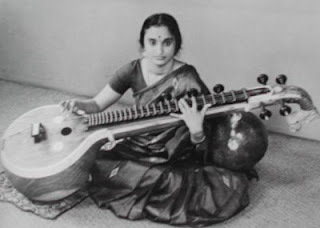 That was Kalakshetra then, a different time, a different generation. Nevertheless it was fun. Sweet memories of coming together with students from all over the world. 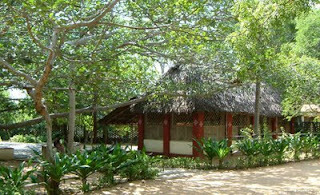 We gathered at this idyllic place, which also happened to be the place we had come to learn the arts. The pace was slow moving with ample space to be in tune with the natural setting of the environment. Lying in bed at night, I would sometimes listen to the winds howling when the night was quiet and if it was going to rain. When the sea was rough we could hear the sounds of the waves on the beach close by. In retrospect, what a beautiful environment to be in. Walking on the sands of the campus was cumbersome at that time. Sometimes I wonder if given another chance, would I have looked at the place in the same way? I guess, I would have greater appreciation now. I was too busy with my classes and practices. Getting up at 4 or 5 in the morning to practice my music. Bathing in cold water and having to only be in a saree was quite a challenge, but the fun was there too. We were not allowed to listen to any other music other than classical music. It took me some years later to be able to get used to listening to other genres of music. But it was fun to be able to come together from different parts of the world and living in the same environment and learning to adapt to the time and place there. We had to adhere to the strict discipline, not to the extent of a monastery though! But I remember meeting Padhu teacher a few years later, when she told me that the place was not the same now. Times had changed and they could not expect the girls to follow their strictness as we would! Wow! What a compliment coming from her. Yes dear Dr. Padmasini who was also a doctor of homeopathy, was in here sixties when I met her. She was a slim lady with silver hair and was always seen in a white cotton saree with the pallu wraped around her shoulders most of the time. She would have been a beauty in her younger days. You could see from her features. We used to fear her for her strictness. She was the doctor we would have to see when we fell ill.
Nostalgic memories of my times in Kalakshetra. Though the years have gone by so swiftly, the memories are still fresh like the jasmine flowers. I always consider it as one of my greatest gifts amongst other gifts, to have been given the opportunity to be in such a wonderful and beautiful place and time. My first memory of enjoying watching the rainfall was when I was about 4 years old. It was a beautiful afternoon and seeing the clouds gathering in the sky, I rushed in to bring my small mattress and started to lay it on the ground at the doorstep of my home.I was excited and did not want to miss the rainfall. The front door was left ajar so that I could look at the scene outside the house. I lay on the mattress with my hands on my cheeks and began to watch the little drops of water falling from the sky. They seemed magical while I felt safe and protected in my home. Rainfall has always fascinated me and when it started to grow heavier; I quickly got up to fold my mattress and ran into my room. The weather was cold and I was starting to get wet. 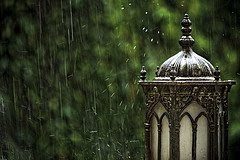 Years later, as I lay on my cot on the verandah of my hostel, I watched the rain again. This time it was a sunday afternoon and some of the girls had gone out. The hostel was quiet and peaceful. The building was located close to the beach. As beaches are, one can imagine the sand everywhere. The winds had blown very strongly earlier and picked up the sand to fly with them. Dark clouds were already gathering over the horizon. The trees were doing their own dance and bending ever so gracefully to touch the ground. They reminded me of how nature was prostrating to mother earth. What a beautiful afternoon! I was feeling drowsy after lunch, but the scene outside the french window was too beautiful to turn away from. Slowly the rain started to fall, gently at first and then it grew heavier and heavier. There were no tears in my eyes. I was happy, other than feeling homesick once in awhile. Many people love to take a nap when it rains, where else I have the tendency to feel all energized and excited. Here was a beautiful weekend and I had no cares in the world. I was lazing around relaxing and watching nature do its beautiful dance once more. Yes the dance of the rain with the earth. 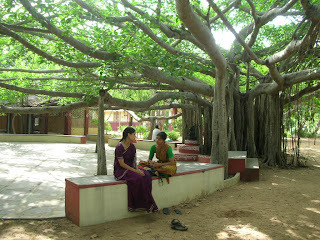 The trees were swaying gently with the wind and the chirping of the birds nearby sounded like musical notes to my ears. I was blissfully enjoying the beauty of nature and all of a sudden images of the fishing folks living close by crossed my mind. The fishing village was situated very near our hostel ground. I felt a sadness overcome me. Here, I was enjoying the comfort of a roof over me and a safe place to stay. I felt protected and was kept warm by my blanket. 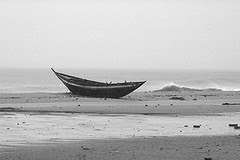 I started thinking of them, living in their small huts on the beach very much nearer to the sea. Ever so often we will hear of winds blowing off their roofs away. For some, the rain will fall through their broken roofs and they would be cold and wet inside. My eyes started to moisten with tears and I began to say a prayer for them.